This long term care mattress is elite in the pressure redistribution category. It is constructed using multi layered foams each layer is strategically placed to offer superior pressure reduction. Designed for pressure relief for patients that are at risk of developing bed sores or pressure ulcers. The 6" mattress depth offers far more comfort than a standard 3" overlay. This hospital mattress offers optimal support and comfort with an emphasis on managing patients at risk for heel pressure ulcers. With a gently sloping heel section, and channel cuts in the middle layer of foam heel pressure off-loading and comfort are maximized and protected. Fits a standard medical bed frame or twin sized box spring. Ideal for home care use. Commonly used to replace an uncomfortable innerspring mattress. This long term care mattress is elite in the pressure redistribution category. It is constructed using multi layered foams each layer is strategically placed to offer superior pressure reduction. Designed for pressure relief for patients that are at risk of developing bed sores or pressure ulcers. 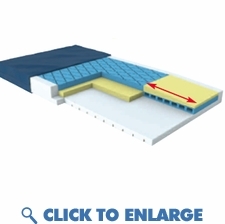 The 6" mattress depth offers far more comfort than a standard 3" overlay. This hospital mattress offers optimal support and comfort with an emphasis on managing patients at risk for heel pressure ulcers. With a gently sloping heel section, and channel cuts in the middle layer of foam heel pressure off-loading and comfort are maximized and protected. Fits a standard medical bed frame or twin sized box spring. Ideal for home care use. Commonly used to replace an uncomfortable innerspring mattress. Outstanding combination of multi-layered die-cut and memory foam available with or without raised side rails. Mattress includes a 6" to 5" heel slope and a �channel cut� center layer of foam under the foot section to target heel ulcer prevention.